Just a reminder...Mixer #16 is up at Mix It Up! I was very much inspired by this week’s challenge to use rub ons in a fun and unique way. I had been going through some old CK magazines and saw a fun technique that Jennifer McGuire had used and so I decided to give it a try. I cut circles out of cardstock and then took rub ons and placed them randomly on the circles. I trimmed them off around the edges with a craft knife. I then cut the circles in half and used them to make a scalloped border along the bottom of my page. It was a great way to use nearly an entire package of rub ons! Scrapbooking is pure joy to you. You are imaginative and probably don't mind getting messy in the pursuit of your art. Your pages reflect your playful personality. You enjoy celebrations and may have many photos of happy gatherings. You see inspiration everywhere you look. 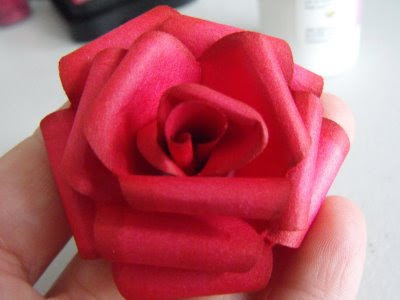 And another fun thing... these pretty paper roses! I saw this tutorial and just had to share it with you all. It is actually pretty easy. As soon as I saw it I had to sit down and give it a try. I definitely can't wait to play with this technique some more and add these pretties so some of my projects! WOW! 2 posts in 1 week!!!! Something must have gotten in to me!!!! You know I love that lo!!! It's completly stunning! The rose is amazing!!! WOW! I can't wait to see those on your los. LOVE YOUR LAYOUT!!! Great idea with the rubons and I love the circle border. If I have a chance today I'll have to check out what color I am??? And the rose, very cool! Thanks for sharing. That layout is AMAZING. I am always blown away by your designs they are so unique and so inspirational! Beautiful layout... and the rose is gorgeous too!!! Come on over to my blog! You've won and award! beautiful layouts and i love making those flowers! What a beautiful layout! Love the circles and what a great way to use those rub-ons. Love the rose...I tried the other day, but mine did not turn out as beautiful as yours. Welcome to the Magistical Memories Blog Hop!